As I have said so many times, the best foods come from the land, and it shows in every "peasant" or "rustic" dish. The foods that I remember most fondly, and the dishes that are most enjoyed by the beautiful Mrs. Tas, are the ones that come from the most basic and honest origins. I believe that modern, even "hi-tech" methods of cooking definitely have their place and are to be revered for what they are - but my favourites, the ones that I always go back to, come almost straight from the land and would be recognizable to "the common people" going back a hundred years, sometimes even longer. There is something that is absolutely honest and satisfying in eating a meal that has never seen a processing plant, let alone the inside of a can or a box. Food such as that, in my mind, carries its own credentials and is a true masterpiece, no matter how humble or unadorned it may appear in presentation. The same holds true when it comes to preserving the simple, good things from the earth, a tradition born out of the necessity of having food stored over for winter. Beginning with the German and Slovak peasant ancestors in the ancestry of our own family - who surely engaged in activities such as drying fruits, fermenting cabbage and making sausages - and extending to the backyard gardens that our grandparents tended and harvested in the tiny, rural communities that their own parents settled, Mrs Tas and I share an appreciation and affection for the childhood memories of going to the pantry and seeing the jars of home-canned goods lined along the shelves in their multi-coloured glory, waiting to be opened and used in some good, comforting thing that Grandma was cooking for supper as the snow fell gently outside the kitchen window as a grey winter day darkened in anticipation of the approaching evening - and the supper we would enjoy around the family table. One of the most basic foods that can be canned is the tomato, and preserved in its simplest and most versatile form - whole - it can be used in a myriad of entrees, condiments and other creations. Our garden didn't do so well this year, mostly due to an extremely late planting due to weather; however, I did retrieve enough tomaotes to can a few jars last weekend, while out at my parents' house. Pressure canning is...required for many canned tomato combination products because the pH value is above 4.6 which is a low acidic food. Tomatoes themselves fall close to the low acid level, just slightly above 4.6 and when mixed with meat for sauces or with vegetables like peppers or zucchini, which are a low acidic food it raises the pH value above 4.6 and must be processed by pressure canning to insure food safety. Foods that have a pH value of 4.6, or lower, may be processed in a boiling water bath canner. 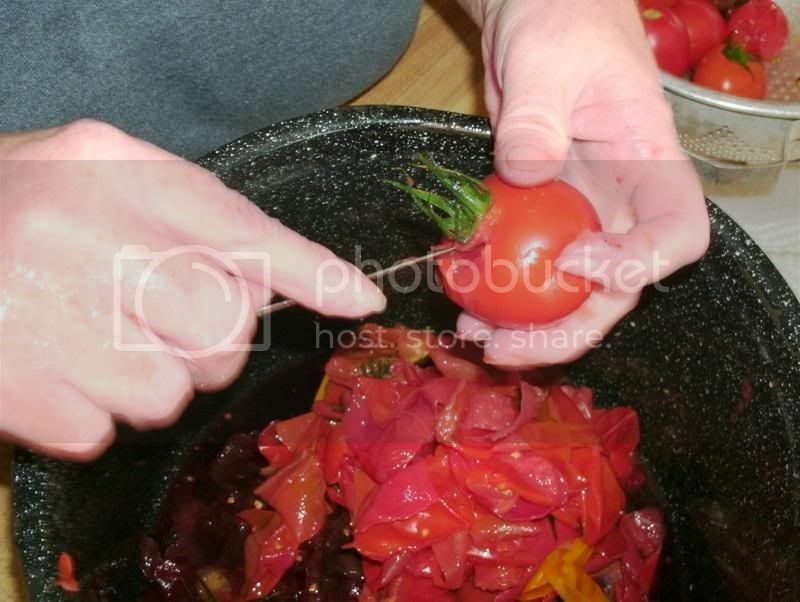 When canning tomatoes by themselves, it is recommended that acid should be added to lower the pH level. This can be done by adding 1 tablespoon of lemon juice or 1/4 teaspoon citric acid per pint of product. For quarts, add 2 tablespoons of lemon juice or 1/2 teaspoon citric acid. This may be done by adding directly to jars before filling. 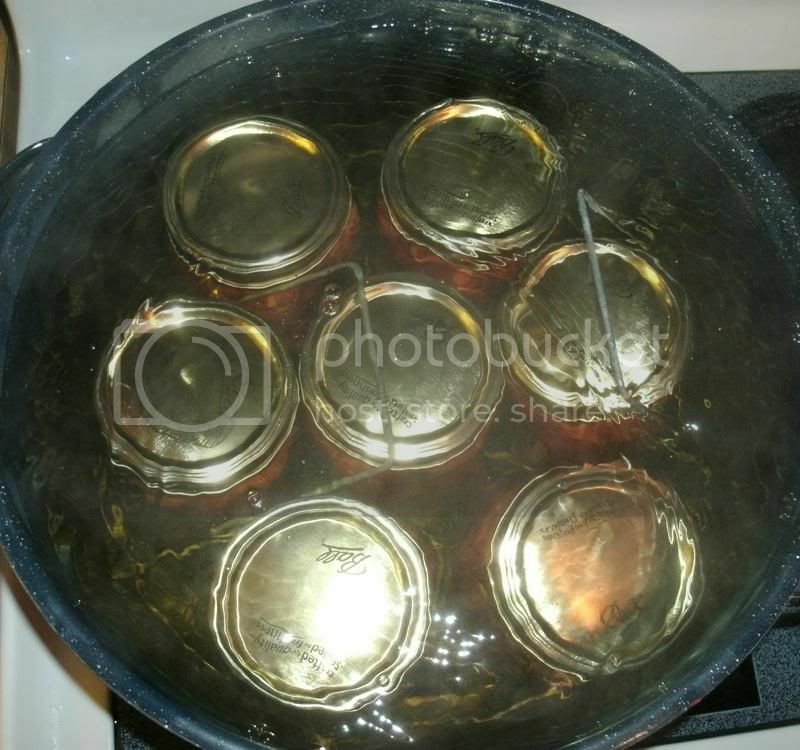 Lids - Place jar lids in a small sauce pan filled with water and boil gently for 10 minutes before using. Do this before you need to place them on jars. Leave in hot water and remove as needed. 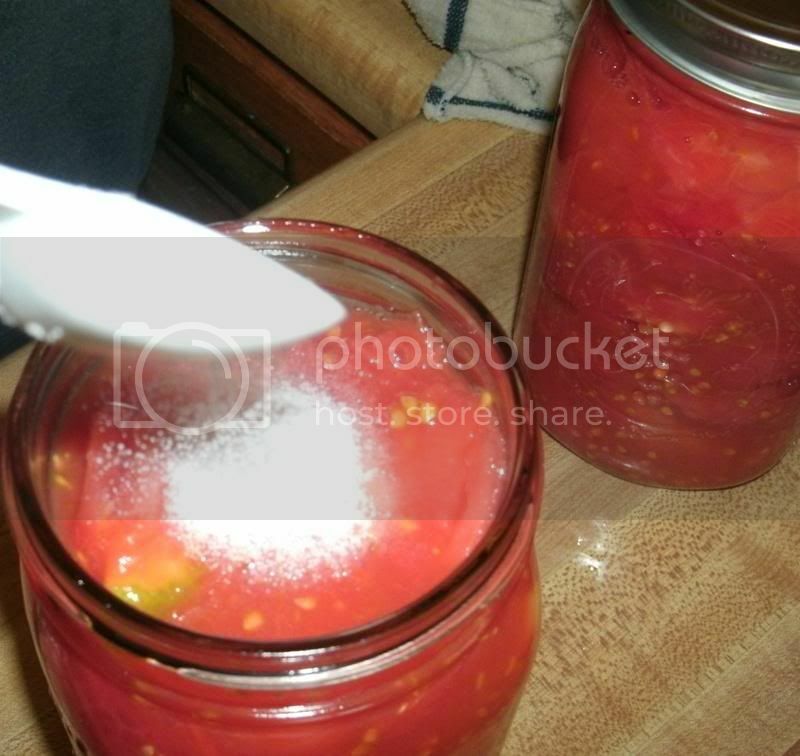 Jars - Sometimes recipes will say that it is not necessary to sterilize jars if they are to be packed with hot food. However, to be safe it is always a good idea. For preparing jars, wash them in hot soapy water and rinse well. Place in a large pot of water or water bath canner, and boil gently for 10 minutes. Leave in hot water until needed. Then remove a few jars at a time and place upside down to drain. They are ready to use in less than a minute. Fill the kettle with the appropriate amount of hot water and begin heating it on the range. The water bath canner requires 1 to 2 inches of water above the tops of jars. This can be difficult to determine before the filled jars are in place but after a batch or two you will learn how much water you you have to add. It is always a good idea to have an extra small pot of water heating just in case. Place jars on rack immediately after packing. Lower filled rack into canner. Jars should be covered by 1 to 2 inches of water. Add additional boiling water if needed. If you add more water, pour between jars and not directly on them (this is where the extra pot of heated water comes in handy). Cover pot with lid. When the water comes to a rolling boil, start to count the processing time. Reduce heat slightly and boil gently for the time recommended for the food being processed. When the cooking time is up, remove jars at once and place on a rack or on towels away from heat and away from any draft. Keep jars separated to allow for air space. After jars have cooled, test for seal. To do this press down on the center of the lid. The lid should be con-caved and not move when pressed. Another method is to tap the lid with the bottom of a teaspoon. If the jar is sealed correctly, it will make a high-pitched sound. If it makes a dull sound it means the lid is not sealed or possibly that food is in contact with the underside of the lid. When completely cool, the screw bands may be removed if desired but not necessary. Be sure to label canned jars with content and processing date. Store jars in a cool dark, dry place. If there is a possibility of freezing temperatures during storage, cover with a blanket or heavy cloth. Jars may also be placed in a box and stuffed with newspaper. Processing, or canning times, are usually for an altitude of 0 to 1000 feet. If you are canning at a higher altitude, the times will need to be increased. This is because water has a lower boiling point at higher altitudes. Because of the lower boiling temperature the processing time is increased to insure that the harmful bacteria is destroyed. For the Boiling Water Bath method, process an additional minute for each 1000 feet in elevation. (i.e.) 5000 feet=5 additional minutes of processing time. Ideal for use in soups, stews, casseroles and sauces. 21 pounds whole tomatoes for canner load of 7 quarts. 13 pounds whole tomatoes for canner load of 9 pints. 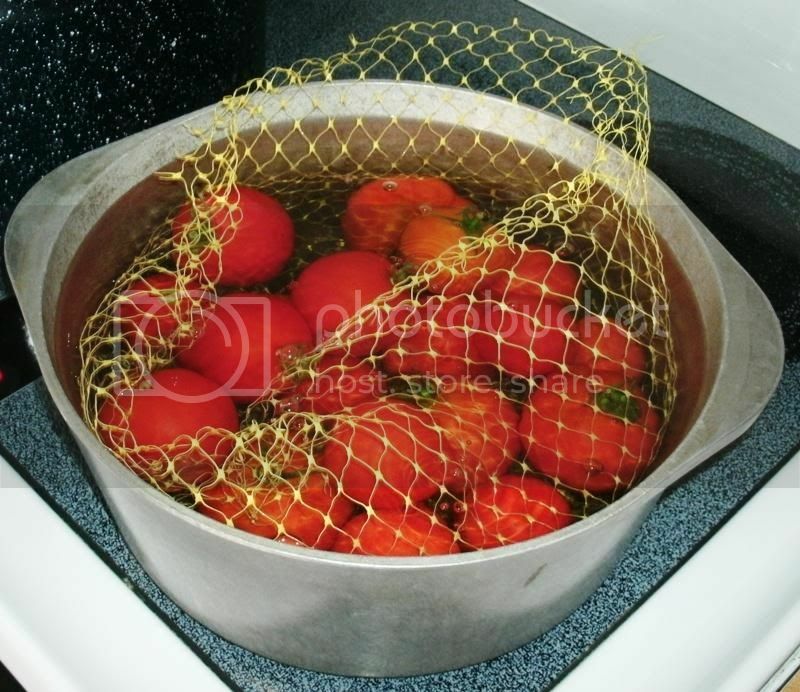 To remove skins, wash tomatoes and dip in boiling water for 30 to 60 seconds or until the skins begin to split. Then dip in cold water, slip off skins, core and remove any blemished or discolored parts. Leave whole or cut in half. Add lemon juice or citric acid to canning jars along with 1/2 teaspoon salt to each quart jar, if desired. 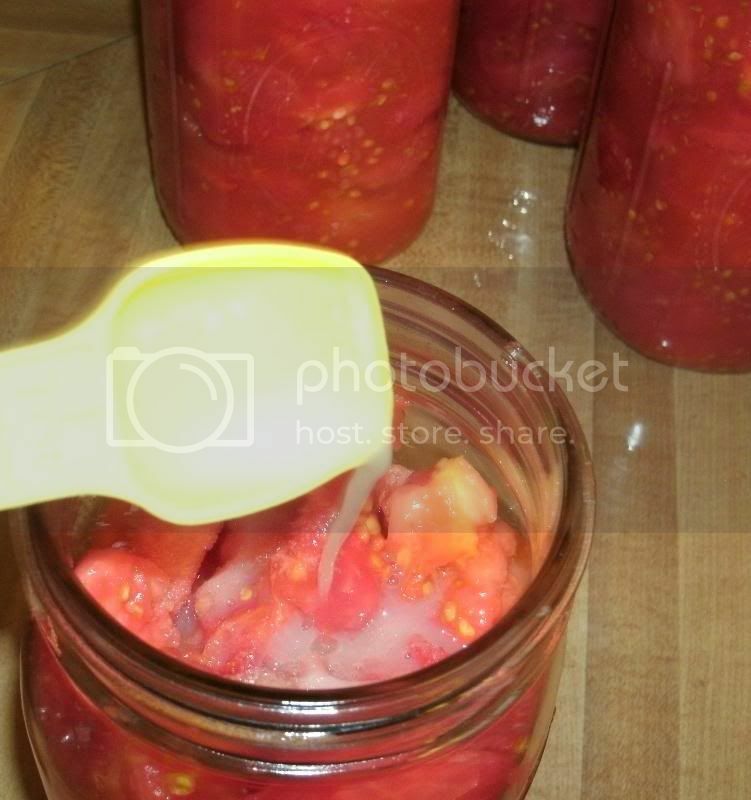 Pack hot jars with prepared tomatoes and press down until spaces between them fills with juice. Leave 1/2-inch head space. Remove air bubbles. Wipe rim and screw threads and adjust lids and screw bands. After processing, remove jars immediately, place on a rack to cool. Here's how things went down when I tried this with some help from my mother. I won't even guess at the specific amount of tomatoes that I had for this session, but it was adequate for exactly eight quart-sized jars, plus one quart of fresh, home-grown tomato juice. In truth, some would argue that you don't even need the lemon juice, or salt, for that matter. 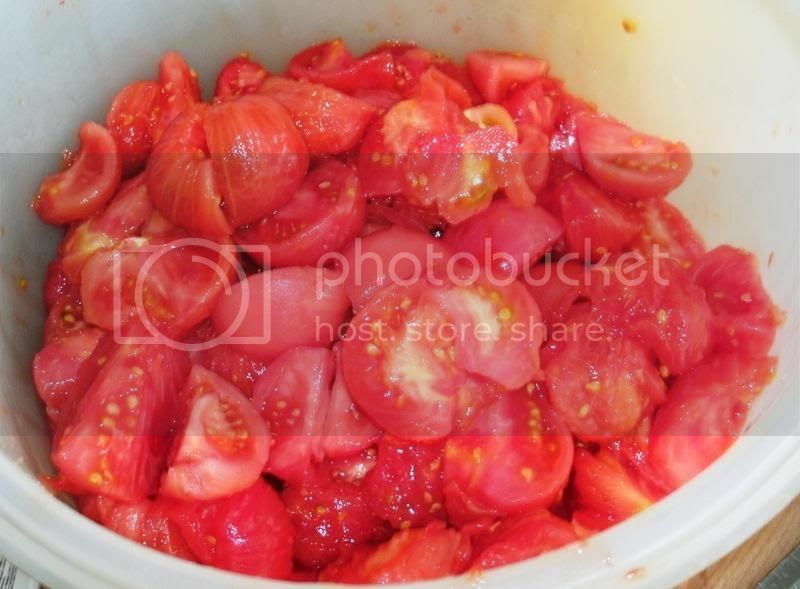 Some will say that the tomatoes contain plenty of acid for safe canning, and that the salt is simlpy for flavour and can be omitted for personal preference or health reasons. I am sure that the opinions on salt are valid, but I add it anyway for taste preferences. As for the lemon juice, many sources recommend 2 tablespoons of bottled lemon juice per quart to ensure that there is enough acid for safe preparation. I've noticed that tomatoes canned with a little bit of lemon juice have a bright freshness as well, so I prefer to use it. Having said that, you can read the information yourself and decide if you want salt and/or lemon juice with your canned tomatoes. An onion bag works great for this, so that you are able to dip them in and lift them out easily. Some people like to cut a small X iinto the bottom of the tomato before dipping, in order to facilitate peeling afterwards. You can if you want, but I haven't really found it to be necessary. You also want to remove any blemishes or dark spots. Note the knife; my mother says that this type of "tomato knife" is the best tool to use for the job. In fact, she didn't even want me to help with this because she only had one tomato knife and said that she had learned from experience that it takes too long with any other type of knife. Who's going to argue with Mom? Depending on their size - and to some extent, your preferences - you will want to leave them whole or possibly cut them into halves or quarters. 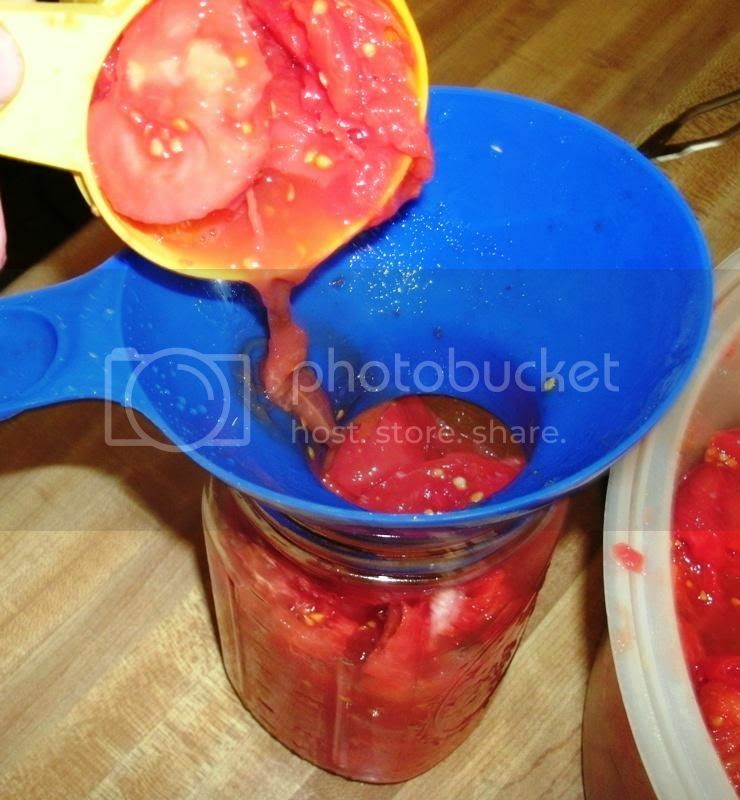 To pack the tomatoes into jars, have everything ready, including clean jars simmering in the canning kettle, clean lids and bands waiting in a bowl or pan of hot water, a clean, hot, wrung-out cloth standing by to wipe the rims of the jars and so on. 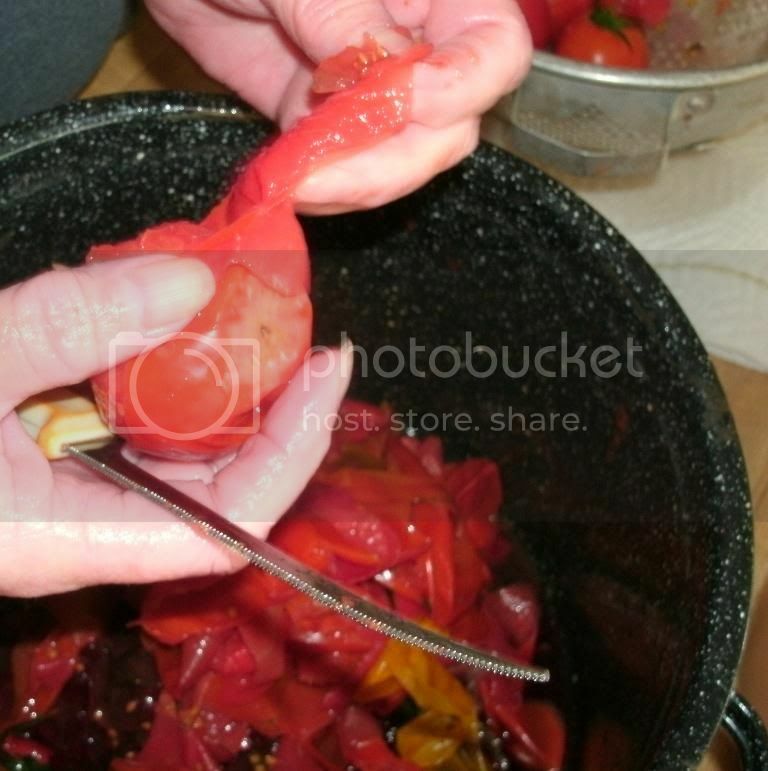 NOTE: Tomatoes packed with water will have a differend processing time versus tomatoes packed in their own juice. Some sources say 1/2 teaspoon per quart, others say 1 teaspoon. Still other sources say you don't have to add salt at all. I added a teaspoon; you can add what you think is right. My mother had never heard of this step, which some people perform for the reasons stated above. 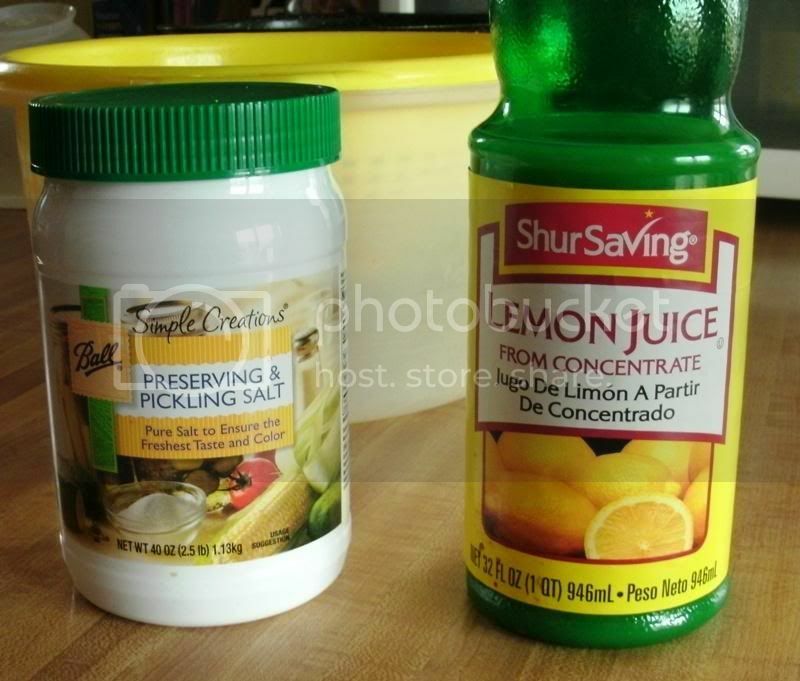 Most references I read recommend adding two tablespoons of lemon juice per quart. My mother was skeptical, so I met her in the middle and added 1 tablespoon per quart jar. NOTE: The literature I have read says to use BOTTLED, not fresh lemon juice. I have no idea why, but since fresh is specifically excluded, I assume there is a reason for this. The water should be simmering just below a boil now. Increase heat to bring to a boil and cover the kettle. Once the water is at a rolling boil, begin the timing for processing. For tomatoes packed in water, the base line for processing quarts is 45 minutes; For tomatoes packed in their own juice, the base line for processing quarts is 85 minutes (one hour and 25 minutes). For our altitude, we added 5 minutes to the processing time. As you can see, we grew a few yellow tomatoes, too! We didn't process these two "extra" jars, so I simply put them in the refrigerator and used them over the course of this last week. So with a little bit of time and effort, we managed to secure a wonderful, nutritious, home-grown base for at least eight delicious meals. Not too bad, considering that the monetary investment was almost nothing! Thanks for looking and I hope this helps someone who wants to give this a try for themselves. If anyone has any questions, please ask! Well, it's that time of year again up here for this project; I imagine I'll be doing some canning of tomatoes by this weekend, if not before. I hope to get all I can into jars in anticipation of having them on hand for some great winter eating! 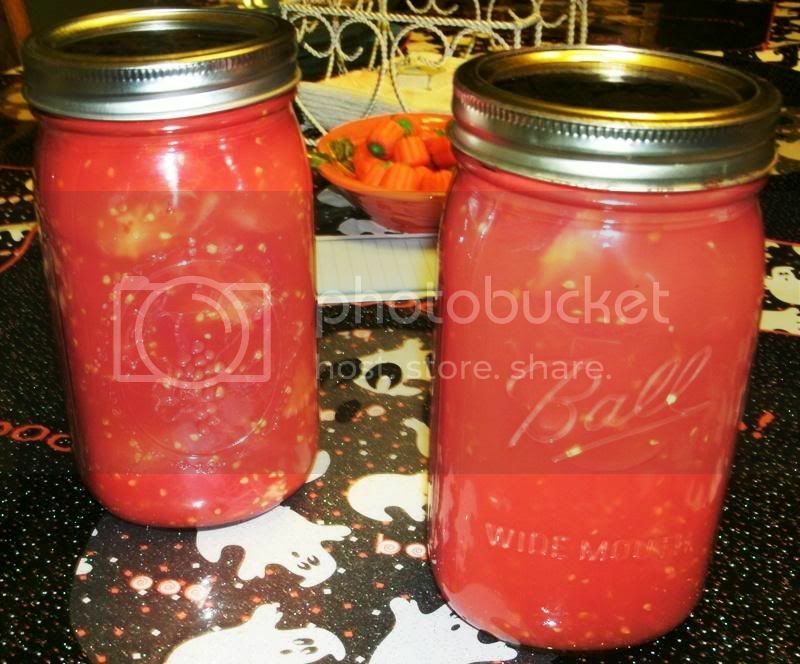 Anyone else have any tomato-canning planned? My tomatoes are done for the season, Ron, 'cept for a few that will vine ripen for fresh eating. This year we put up mostly puree, cuz we use more of that than anything else. A note on figuring how high to fill the canner. Because I learned in the day when sterilizing was the norm, I still do it out of habit. This kills two birds with one stone. Fill your jars with water and set them in the kettle. Then cover with water to at least an inch higher than the jars. Bring kettle to the boil. Meanwhile, put the lids and rings in a bowl and go about prepping whatever you're canning. Once the canning kettle is boiling, leave it go about ten minutes. You've now sterilized the jars. When you remove the first two or three of them pour the water into the bowl with the lids & rings. Fill the jars and go on to the next few. If you haven't figured correctly, leave any unfilled jars in the canner. When you add the filled ones back, the water level will return to the level it needs to be. makes perfect sense, and sounds like a good practice! I've got enough tomatoes to can three or four quarts tonight, so I'll get that done and will can more as they ripen. My dad and I both had pretty successful tomatoes this year, with several different varieties including Early Girl, Celebrity, Crimean Black, Cherokee Purple, Gurney Girl, and assorted Roma, Cherry and Grape tomatoes, including a Crimean Black Cherry tomato that is really, really nice. I can't remember the exact name of that variety, but I will be posting more about that and other Black Russian and Crimean varieties next year, as I have seeds for several to try then. Normally, I just can them all together, and they make really good tomatoes to add to meals over the winter. If I am making a specific product, such as Italian tomato sauce, I might use just one variety, but I see no reason for this for some good, old-fashioned canned tomatoes. There is some question regarding the processing time. My opening post says 85 minutes, but my dad says he processes his 45 minutes. I'll read upon this and edit the opening post if necessary. Update to the post above: the tomatoes are processing as we speak, along with 1 pint of tomato juice. I thought that I might squeeze 3 quarts out of this batch; however, I packed the tomatoes quite tightly, as I had been taught, and consequently ended up with 2 quarts, plus the juice. After consulting the Ball/Kerr website, I decided to process for the longer time, the same as I did in the opening post; adjusting for altitude, I went with 90 minutes total. I've been canning a lot of tomatoes lately, which is good, because I really love home-canned tomatoes. 6 more quarts of halved/quartered tomatoes and a pint of tomato juice in the canner right now, plus 6 or 8 more quarts to go in the coming days, and maybe 7 or 8 more pints of tomato juice - we'll see. I'll get a final count of everything when I am done. Last night I also put up 5 half-pints plus 1 quarter-pint of slivkový lekvár ~ if you know what that is, then your family or friends are pretty cool! Just out of pernicious curiosity, Ron, how big is your canner? Mine holds 7 quarts, and I hate doing anything less than a full load. What with the time it takes to boil, and the amount of water used, etc. it just seems more efficient. You've inspired me to actually count what I put up. We've already used several jars of puree. Not counting those, we have 8 quarts of whole tomatoes, 6 quarts of diced, 6 of puree, and 5 quarts of spicy juice. We're not tomatoe juice drinkers here. I use the juice, instead, as a liquid in stews, soups, and sauces. I'll have to do a total count when this is all over, to see what I have in total for everything. A year or two ago you started a thread titled "Putting food up for winter." We can revive that or start a new one. I haven't used any of my canned goods yet, wanting to finish them up first and get them on the shelf, but I'm positive that I've done more canning this year than in the last four years combined, maybe ever. But, to answer your question, my water bath canner holds 7 quarts, and I actually have two of them, but only one burner on the stove big enough to use, of course. The reason for the sporadic progress is that the way the tomatoes are, I am kind of at their mercy. A few will ripen at a time, and I will put them aside while others ripen until I have a full load, or until I can't let the ripe ones sit any longer. Then of course, when we pulled in all of the green ones at the First Frost, I needed (and still need) to wait for them to ripen. Because of these factors, sometimes I can only do 2 or 3 quarts at a time, but last night I prepared to do 7, because I had a huge stock-pot full of ripe ones ready to go. As it turned out, I only had 6-quarts worth, but lots of juice, so I simply did a pint of juice to fill the canner. There are about 3 or 4 more pints of juice in the fridge that I will process with the next batch of newly-ripe tomatoes. As for the juice, I like drinking it, but like you, I mostly use it to fortify any recipes, or to add to beer or other things along those lines. I don't set out to make the juice, it is just a by-product of the tomatoes as I am skinning and cutting them, so I can it along with them and put it on the shelf; nothing goes to waste - even the cores and skins go back into the garden! Also, I have a bit of a bit of a riddle for you: all of his life, and also according to his old Ball/Kerr books (circa 1970s), my dad has been going by the instructions, which state that tomatoes packed in their own juice are processed for either 35 or 45 minutes (I forget which), plus altitude adjustment, if any. Now, my newer Blue Book (2009 - and it isn't Blue! But it is a good one~), along with nearly every website I can find, says to process tomatoes in their own juice for 85 minutes, plus adjustments. The 45 minutes is now for tomatoes packed "in water" (which frankly seems like a silly way to do it - although I am sure there is a reason). But, the question is - so you have any idea as to the reason for the change in processing time, especially such a dramatic one? I brought this difference to Dad's attention last night, but really had no reason for it that I could use by way of explanation. He said that he hasn't died yet from his tomatoes, and his mother did them the same way, but if there is a good reason, he can do them longer. I don't know for sure, Ron, but suspect this reflects an improvement in temperature measuring devices. Keep in mind that the time figures are based on the interior of the product coming to 212, and holding there for a set period of time. That's the basis of all modern canning. The reason for time differences between water and juice is that the juice is denser, and, thus, takes longer to come to temperature and transfer that heat to the actual tomatoes. But, as you note, that's a heck of a time difference. My latest version of the BBB (#32)doesn't make that differentiation anymore. Whether packing them in water, or in "cooking liquid," (i.e., juice), processing times, unadjusted for altitude, are 45 minutes for quarts, 40 minutes for pints. Those are the numbers I use, and feel perfectly safe with them. Sounds sensible, Brook - since this posting, I've gone to the 45 minutes (plus 5 for altitude). A couple of weeks ago, my dad called on a rainy evening and said, "They're expecting it to freeze tonight or tomorrow; if you want any tomatoes, come out and get them." My own tomatoes didn't do very well at all this year, mostly due to my neglect and the fact that my adult children living at home don't see any need to help out. The few tomatoes that we did get were great, but in such small numbers that we simply used them as we got them, either in recipes or on their own. 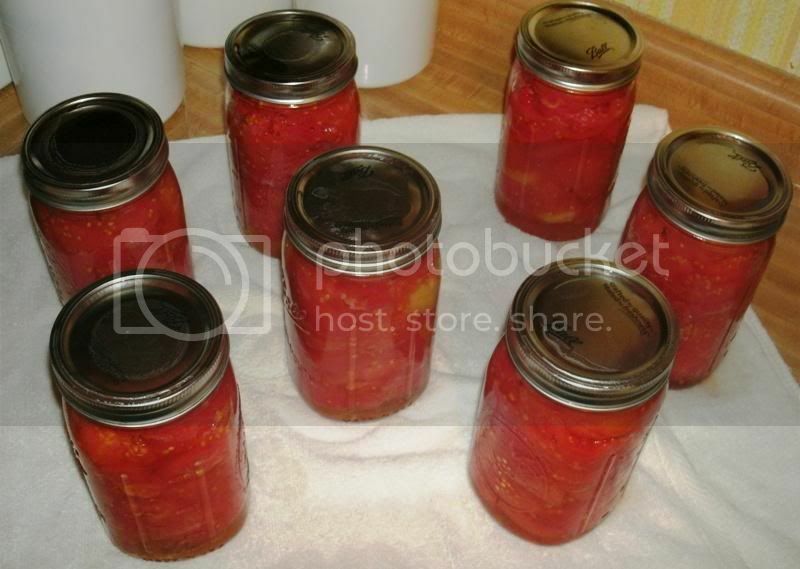 Until Dad called, I was resigned to the sad fact that I wouldn't be canning any tomatoes in 2016. So, with happiness, I hung up the phone, grabbed my youngest son and a flashlight, and headed out to my parents' place. There, in the dark and the rain, we picked three full grocery bags of green tomatoes. This cleared out the garden, giving us Celebrities, Cherokee Purple, Early Girl and a couple of larger varieties that I am not sure of. I've been canning them in small batches as they ripen in enough numbers to make it worth the effort; so far, I have 5.5 quarts of tomatoes and a 1.5 pints of tomato juice. I expect to get another 3 quarts, plus or minus a pint, and some juice when the rest ripen as well as some juice. Free provisions that cost absolutely nothing except a little effort and time; and, the better thing is, they didn't go to waste.